Don’t Put the Cart Before the Horse. This is an age-old proverb handed down through generations. But how does this phrase relate to your Grange, and its communications? Granges are seeking out positive press on a daily basis. Every Grange yearns to have that newspaper article published, radio interview or television coverage, and even have a social media post that goes viral, in the hopes of gaining new interest, and thus new members. What is your Grange doing to make this positive press a reality? Granges cannot expect to be the center of attention when they are not sponsoring activities and projects of interest to the public which would warrant the attention of the press and the public. Hosting events and undertaking community service projects help to raise awareness of your Grange as well as promote its mission. Is your Grange hosting events and pursuing projects that affect your local community? If not, why not plan something today. We’ve all heard the excuses -- not enough help, members too old, no proper venue, no funds, no one attends -- the list goes on and on. The fact is - they are just that, excuses. Each Grange is as integral to their community as their members make it. 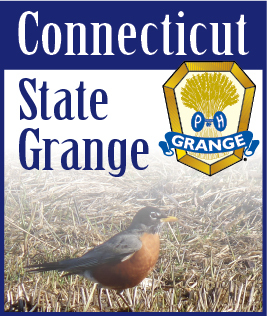 We are proud to say that across Connecticut, our Granges are as diverse as the state in which we reside. We have Granges that are rural, suburban and urban - each with distinctively different communities in which they serve. Every Grange needs to take a look at their activities and projects and assess their individual situations. How does MY Grange affect MY community? Once your Grange has begun planning projects and activities outside of regular meetings, the next step is to alert the press, and promote your event or project through all different Medias. You cannot get the word out too much or too soon. Press Releases, flyers, posters, social media, post cards and mailers to your members - these are all sources that should be included when promoting your Grange. Don’t want to tackle publicity? Contact the Public Relations Committee. We are here to help, and have a proven track record with the Connecticut press. Be sure to plan enough time to get the job done. Pushing deadlines can only hinder the amount of coverage received. “Putting the cart before the horse” means working out of order. It can be counter-productive, ineffective for both the Grange and their communications, and shows the organization as disorganized. It frankly doesn’t work. Take the steps to move forward with your Grange and make a splash in your community, and the positive press will follow.